Huawei's Limits | France won’t succumb to U.S. pressure for an outright ban on Chinese equipment from 5G procurement, but the likes of Huawei will be asked to pay a price they may find unpalatable. Under a bill parliament starts debating today, companies will have to agree to submit their equipment to broadened technical tests, which may be akin to handing over industrial secrets, in order to be eligible for the lucrative network contracts. 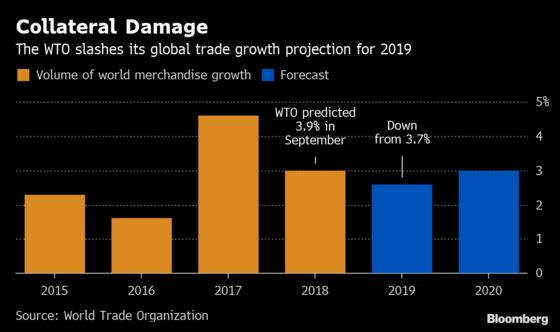 The World Trade Organization slashed its global trade growth projection for 2019 to a three-year low, citing the impact of rising commercial tensions and tariffs. The revised figures provide an important gauge of the stakes involved in Trump’s economic fight with China nearly a year after the initial salvos of the trade war were fired.